Enjoy wonderful oceanfront views from this lovely 3 BR/2 BA condo, located on the 6th floor in Sea Winds resort. The fully equipped kitchen is great for cooking and dining in, with seating for 6. New set of front loading washer & dryer for your convenience, with new, full-sized kitchen appliances. Bedding is : 1 King in master, 1 Queen in BR 2, 2 Twins in BR 3(bunk beds) + Queen sofa sleeper in living room. 2 Flat screen TVS + 2 additional TVS are in bedrooms and living room, with DVD player as well. Living room has a sofa & love seat. An indoor pool with outdoor sun deck are a nice feature of this property, as well as the picnic area and charcoal grill. You are just steps away from the dunes and beach, in the beautiful Windy Hill section of North Myrtle beach. Sea Winds is within a 1/2 mile of Barefoot Landing shops and restaurants; over 120 stores, offering everything from ice cream to beachwear. Enjoy live theater at the Alabama Theatre and great concerts at the House of Blues. The white tiger show is within Barefoot Landing, and you may spend many evenings strolling through this complex, feeding the fish, turtles and ducks. There is something for everyone! You may venture a little further South to the new Wonder Works (the upside down house) near Broadway at the Beach, Ripley's Aquarium, the IMAX Theater and hundreds of other attractions located there. Or locally, just a few blocks over is Barefoot Landing with over 60, specialty shops, beach stores, restaurants and attractions for the whole family to enjoy. Stroll thru this beautifully landscaped complex, and shop for jewelry, clothing, accessories, lots of beach items, and don't miss the black market mineral shoppe, specializing in real gemstone jewels, and inexpensive rocks and collectible stones. Alligator Adventure will thrill kids of all ages, with alligator feeding times, hands on reptile shows, and 11 acres of wildlife viewing. Weekly, Saturday to Saturday Rental (during peak season) No nightly rentals. Check our calendar for availability. For everyone’s comfort, our condominiums are No Smoking, No Pets, No Motorcyles/Trailers, No golf carts. Million dollar view, good beach access. Teeny parking places. Only one elevator working most of the time (fun on checkout day). Please put a table on deck to utilize gorgeous view. Minimally clean, highspots only. Needs upgrading for the $$. Thank you for your review on this condo. We would have liked to hear from you, during your stay, to promptly correct any issues with cleanliness at the property. ODVR and the owner do take both compliments and critiques as a means to improve our services and your guest experience. We hope that the wonderful ocean views did make up for some of the usual parking and elevator concerns -- We hear this during the summer regarding every condo complex up and down the Grand Strand. Thank you for staying with us and please reach back to us in the future for another chance to make a better impression. We really enjoyed our stay at unit #604 Sea winds. Everything was clean and comfortable when we arrived. Great access to the beach and a nice pool the kids enjoyed. Would stay there again. Sea Winds in Windy Hill, is just the right place to provide what every family is looking for and we think you mentioned exactly what we would want guests to know!!! Thank you for taking a minute to offer the thoughtful review and the owner will be delighted to get top scores for their condo. Many happy returns!!!! View was perfect and unit was clean was well equipped. A definite revisit on this one! Great family vacation. Would rent again. Best condo we have stayed in! This spacious, beautiful, well-maintained condo was such a pleasure to wake up in every day for 2 months. I would open the doors each morning and have my coffee while watching and hearing the ocean. We are snowbirds and appreciated all the amenities in this welcoming unit (they even had tape, extra scissors, battery operated candles, and extra batteries in the bar drawer!) Everything worked and worked well. While in the area, we took a helicopter ride and a flight on the Skywheel, 2 river tours, walked the boardwalk in Myrtle Beach, went to the wax museum and while there, we took the zombie challenge and also rescued the princess in Hannah's Mirrors. Brookgreen Gardens is a must see and the tickets are good for 7 consecutive days so we went back the second day for the boat tour. We even found a Highlands Games Festival! We would return each night, open the sliding doors and sometimes watch the lights, moon, and waves from our deck. The bed was super comfortable, the extra medicine cabinet storage in each bathroom was great for lots of items, and I loved the flooring all through the condo. They also had about everything you could want for the beach like chairs, small bodyboards, and toys for kids to play in the sand. We used both the furnace and the AC while there and both worked perfectly. My personal favorite was the washer and dryer...so convenient in the kitchen. The dishes were a great set with multiple salad bowls, soup cups, and plate sizes and there was a good variety of pots and pans. Sea Winds pool and hot tub were the crowning touch! We loved this condo and especially the Windy Hill area which seemed quieter and more family friendly that Myrtle Beach. Thank you for your great review for our Sea Winds condo. The owners take pride in their condo and making sure their guests are fully satisfied. We at Owner Direct Vacation Rentals pride ourselves on maintaining the condo as well. We are happy to hear how much you enjoyed your stay and we welcome you back anytime! Beautiful condo , great location! Beautiful three bedroom, two full bath condo in North Myrtle Beach. Tastefully decorated. No details left out! Kitchen was fully furnished with dishes, pots and pans, utensils, wine glasses, etc. There's a cute bar area too! It was very convenient to prepare meals and dine in, if desired. Grocery stores located nearby. The condo also has a washer and dryer; great feature. Each bedroom has a TV, in addition to the one in the living room. 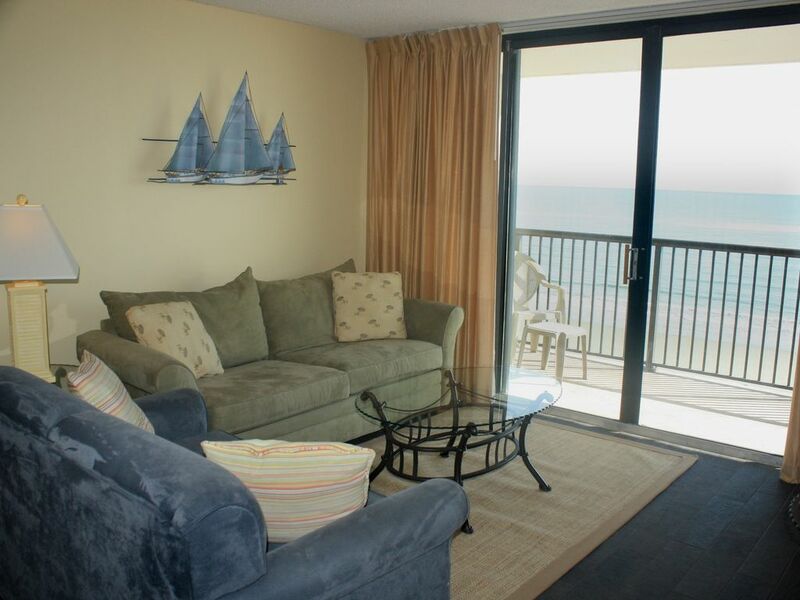 The balcony offers a great place to relax at the ocean without leaving the condo! Beach was clean and quiet. Beach chairs, umbrella, and beach toys all available in condo-much appreciated! Indoor pool and hot tub available too! Many attractions and good resaurants are nearby, with great seafood! Details were handled easily with VRBO office. On-line condo pics and description are very accurate. South Carolina's 60-mile long waterfront, the Grand Strand, is a smorgasbord of family fun. The clean beaches are the main draw to the Grand Strand, but there's more to her than miles of brown sand. One of the best East Coast family vacation destinations, the Grand Strand boasts hundreds of golf courses, restaurants for every budget, shopping & attractions for all ages! From year-round festivals to entertaining dinner shows to thrilling amusement parks & challenging miniature golf - there’s no better playground! In North Myrtle Beach, visit Barefoot Landing & stroll through this beautifully landscaped complex for shopping, dining, attractions & more! Seasonal firework shows over the lagoons & don�����t forget to feed the fish – an inexpensive experience that brings smiles to young & old! With over 70 beach stores, specialty shops, jewelry stores, handbags, clothing, ice cream, restaurants, bars, etc. there is so much to choose from! Barefoot Landing is also home to the Alabama Theater with live productions nothing short of Broadway; and The House of Blues, with a great breakfast buffet, lunch & dinners, along with seasonal live concerts and a Murder Mystery dinner theater! Alligator Adventure will thrill kids of all ages, with alligator feeding times, hands on reptile shows & 11 acres of wildlife viewing. When you purchase your ticket, you can receive a 2nd Day Free Pass that is valid for a return admission within 7 days – no additional cost! Now open - the Duplin Winery on Highway 17 near Barefoot Landing. From the rural vineyards of Rose Hill NC, visitors can sample a wide variety of their award winning wines. A casual fun filled atmosphere where folks can come & drink wine after a day at the beach. Flip flops are welcomed! There are sports & recreation options at the new North Myrtle Beach Parks & Sports Complex – located off Highway 31 & Robert Edge Parkway. The new area includes 7 picnic shelters, 3 playgrounds, walking/biking trails, 25 acre lake & 10 acre meadow. "Go Ape" & experience a zip line or one of their tree top adventures! If golf is your game, greater Myrtle Beach Area has over 120 courses! You will receive a free MYGOLF card which will discount your foursome and give you nice discounts on over 60 restaurants in our area. Live theater productions include the Carolina Opry & Dolly Parton’s Pirates Voyage & Medieval Times – all great family oriented shows! A short drive north, you can visit the Cherry Grove area. A large draw to this area is the Cherry Grove Fishing Pier – there is a bar/restaurant on the pier & the tourists & fishermen alike love this location! Walk the pier or fish using your own rod (rentals also available!). Shopping in Cherry Grove means hitting the mom-and-pop shops like Boulineau's IGA & other locally owned stores. With the fishing villages of Little River & Calabash, NC located just across the waterway, there's no shortage of fresh fish, shrimp & crabs to choose from. If casinos peak your interest, head to Little River & take a cruise on the Big M Casino – a floating casino that heads out into the ocean for some gambling fun! La Belle Amie vineyard is a short drive across the Intracoastal Waterway! And in Calabash, NC - Callahan's Nautical gifts is your "one stop gift shop" including all things Christmas! Located about 15 miles south, in Myrtle Beach, is Broadway at the Beach – offering great places to shop, eat, celebrate & play! A consolidation of hundreds of stores, shops restaurants & attractions including Ripley's Aquarium, Zip Line rides, Wonder Works (hands on science museum) & many more to choose from! The night comes alive in Celebrity Square with dance clubs such as Froggy Bottoms & Club Boca, Revolutions, Fat Tuesday & the dueling pianos at Crocodile Rocks! Entertainment for everyone!! Myrtle Beach continues to grow the downtown area – now including the board walk & promenade, 200’ Ferris Wheel (enclosed, air conditioned cars), gift shops, arcades & attractions in the old Pavilion area. You can get lost in all the Gay Dolphin has to offer – a souvenir shop packed full of all types of gifts on several floors!! A beach must visit while you’re in town. The Market Common is a place where you can experience exceptional shopping & dining in a beautifully-designed village setting. The center includes some of the nation’s most celebrated names in retail, ice cream & pizza for the kids; one-of-a-kind restaurants & the Grand 14 movie theater. Popular destinations on the south end of the Grand Strand are Huntington Beach State Park, Brookgreen Gardens & Atalaya Castle. If you venture this far south, don't miss the Marsh Walk - a very cool boardwalk of restaurants along the shores of Murrells Inlet. THE GRAND STRAND HAS SOMETHING FOR EVERYONE! PLEASE NOTE: A Service Fee may be charged by third party websites. We do not have control over the amount of the fee nor do we receive any of the funds. Information about the Service Fee should be available on the specific booking channel website. All rentals are required to have a $1000.00 Security Deposit (refundable) OR purchase Damage Protection Insurance (non-refundable). Damage Protection Insurance (up to $3,000 of coverage, increased amount of coverage) is included for a cost of $64 which replaces the need for a security deposit. If Damage Protection Insurance is not purchased, a refundable Security Deposit is required. We also offer Travel Protection Insurance (expanded coverage) at an additional cost of 6.95% of the total rental rate plus taxes and fees.